Almost five years ago I attended a lecture from a world-renowned Montessorian, Dr. Angeline Stoll Lillard. During the Q & A period I asked her about ways that homeschoolers could set up Montessori classrooms. I was so bummed when she rebuffed me, saying something like, "That wouldn't make any sense, to spend $10,000....." Maybe she was thinking of the money spent by schools who buy the fancy schmancy materials and maybe she was thinking of families with just one or two children. I'm glad to see an explosion of interest in applying Montessori principles at home! This post is about how to set up your space without going broke and how to know when to buy the "good stuff" and when to get by with substitutes. It can be overwhelming to put together a Montessori environment. Where to start? How to find the space? How to find the funds to buy the equipment? (no, don't rob a bank!) If you do things gradually, what should come first? These are all great questions, but the answers will be different for each and every one of us. My youngest is two-and-one-half years old, but I started piecing together Montessori materials almost 10 years ago, long before Pinterest and blogs explained how to make things. There were some online groups, however, that shared approaches to making your own materials. The problem is that some materials require such precision to make or they need to stand up to a lot of wear and tear or the cost of raw materials needed (including the cost of schleppage) to make the item is almost equal to the cost of buying it! There are some works (like Folding Cloths, Cards & Counters, Fabric Matching, and seed sorting) that we were required to make as part of our training at Belmont University. These homemade works are quite do-able and I still use what I (hastily) made. Sometime soon I'll write up a DIY post on those. This post won't address all of the questions you may have about building up your classroom, but I hope it will serve as a guide to knowing when to splurge on the good equipment and when you can manage with homemade or just substitute. Keep in mind, though, that there's a reason why it's encouraged to use beautiful materials: not only are children naturally drawn to them, but--if these materials will be part of your home/life--YOU'LL want them to be non-grody. I think these were from World Market. Sometimes I would stay up late drooling over the Fancy Schmancy Montessori catalogs, thinking some day I would have a HUGE garage sale and make enough money to splurge. But then I learned to use the catalogs as an inspiration or a springboard. You can copy some of the sets you see, like the polishing work baskets or the Magnetic/Non-Magnetic works, for a fraction of the price. Substituting can require an even greater level of resourcefulness, one that can be fun if you're a frugalista or have really talented friends. For instance, I put together my own polishing works (that's one basket for silver polishing, one for bronze, one for wood, and one for shoes). These require that each basket have a number of tiny square cloths, all the same color but with three different types of fabric. It was much cheaper for me to pay a seamstress friend with a serger to make one dozen each of the broadcloth, flannel, and terry cloth squares than to buy those. But when it was impossible for her to find brown terry cloth in the fabric stores, she found a brown bathrobe at a thrift shop and -- viola! 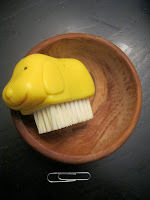 -- she made one dozen perfect little cloths for polishing shoes. If your eyes are glazing over and you don't enjoy the thrill of the hunt, you can simplify. Try to remember what the essential lesson is for each work and modify accordingly. This may mean some careful thought. For example, for a while I thought I could use a set of colorful cardboard nesting boxes to substitute for the Pink Tower. I suppose I could have even painted the boxes all the same color so that their designs weren't distracting, but still the weight of each cube was not very different. 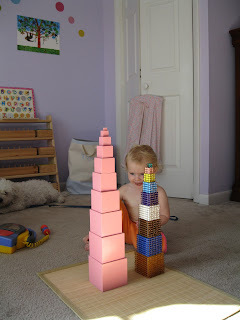 Part of the essential lesson of the Pink Tower is that the weight of the cubes varies with their dimensions. Also, the smallest cube is one centimeter per side and the largest is 10 centimeters per side. There is an indirect preparation for math embedded in the work, and it also correlates precisely with another work, the Broad Stair. So it was time to splurge: I bought the darned thing. 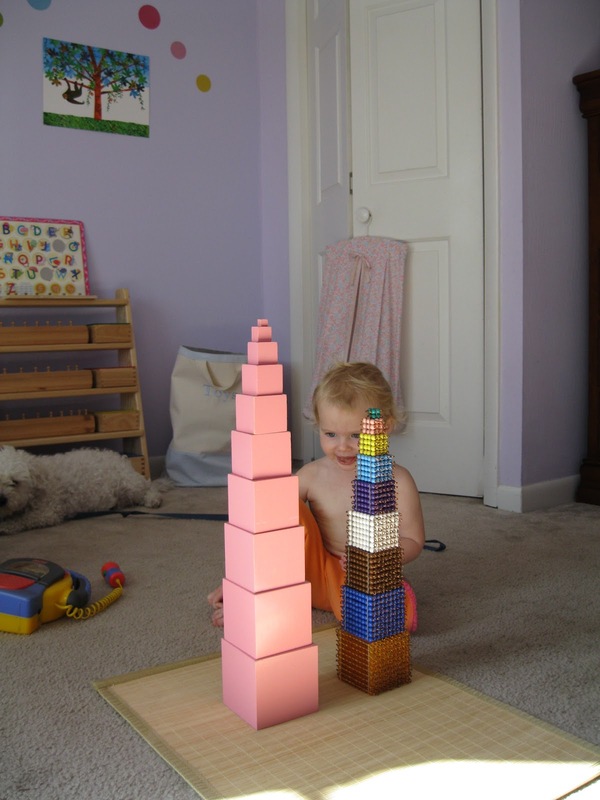 Unfortunately there's no such thing as a Montessori store where you can walk right in and buy a Pink Tower. And that's one of those items that's truly a BIG PAIN to make from scratch (along with anything that requires serious power tools, really nice wood, and extreme precision). Toddler table and chair from Lord Equipment Co (I think it can be part of a nesting set). I've also seen a great post about making a larger IKEA table smaller for children. As I've said before here, garage sales and thrift stores are a great place to find many items. Craigslist, eBay and begging for used items from local Montessori schools can be another source. I bought a set of Knobbed Cylinders on eBay for cheap and it was a mistake. Some cylinders are difficult to take out or put back in, and one of the knobs came off. This is something worth buying "for real." The breakfast-in-bed tray was a Mother's Day gift or something, but comes in handy for floorwork that needs a flat surface. You can see on the Knobbed Cylinders where I burned the wooden block while trying to sand the opening. The red cylinders are part of a 4-color set of Knobless Cylinders worth buying. I think all of my "official bought Montessori materials" were bought from either Alison's, Montessori n' Such or Montessori Services. Tools should be child-sized. These are hard to find! They have to really work. Test-drive your works before presenting to children for the first time. You may be surprised to learn that the tray they have to carry across the room is WAY too heavy, even for you. And even items sold from Montessori catalogs may not be very practical, so beware! 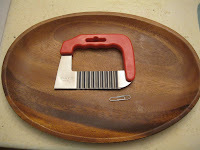 This is great for cutting carrots (paper clip is to give you a sense of scale), though not sharp. Imagine my surprise when I found (and splurged!) on this Tupperware set! Tray from IKEA. Hodgepodge of sources, including IKEA. This letter organizer has been used for early readers, note cards for art projects and for cutting boards. 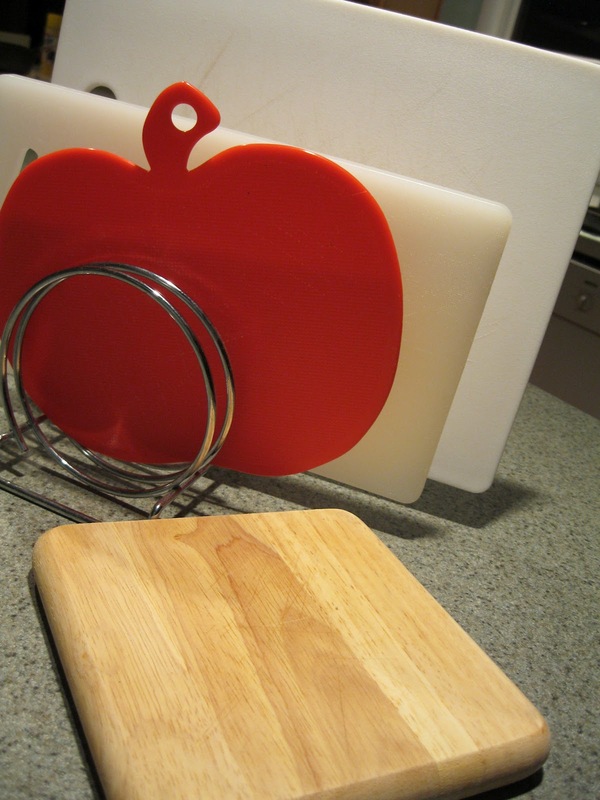 I like to have the small wooden cutting board because the normal-sized ones are really heavy. See these earlier posts for more detailed info on garage sales and affordable mats. You can also look around online for cheap solutions, but be wary of writers who don't have The Big Picture (see my example on the Pink Tower). 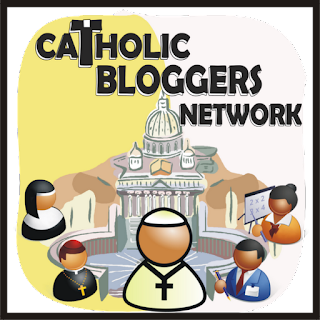 This post is helpful, and the author is trained as a Montessori teacher, a teacher within the Catechesis of the Good Shepherd program, AND she's raised two kids--all important credentials in my book! Don't be afraid when things aren't perfect. One reason I've enjoyed learning about the Montessori philosophy is that it helps me to understand when and how to make substitutions, based on the essential lesson of each work. This hallway is changed every so often, as you can see in this more recent post on the Catechesis of the Good Shepherd. The above photo is a great example of how your space may be an amalgam of materials from many different sources (here, the dressing frames were ordered from a Montessori catalog, the floating shelf came from IKEA, I think the ladybug clips to hang artwork came from Land of Nod, and the baskets were from Pier 1 and TJMaxx. Also visible are some Sandpaper Letters that I probably bought from Alison's or Montessori n' Such and some cheap, hand-me-down melamine shelves that were meant for closet organization. This hodge-podge works for us! This is just one hallway of our house, so it doesn't take much imagination to figure out why this blog is called "Montessori Messy"! But it's an inviting, enriching space for toddlers on the move. We've accumulated these materials over time--some of them bought for my school 5 years ago, some received as birthday or Christmas presents for the kids, some made by me and some are blatant copycats of works that I saw in catalogs. This post is too long already, so I'll keep you in suspense regarding some specific substitutions that can save you a bundle! Okay, I have a big question about the Montessori approach as a whole. When I was little, I learned to polish silver by sitting next to my mom in the kitchen and rubbing the small sugar bowl while she did the bigger pieces. If we are already doing many of these tasks with our children, why bother investing in miniature sets at home? I can see how many of these could be useful in a classroom setting, but not so sure about how much to replicate at home. Thank you for the links and suggestions above! I am very excited about exploring these in John's soon-to-be new room. Good question! Complicated answer. We have to take into account our personalities and our children's, and we need to find a balance with the overall tone we want to set in our homes. Let me explain. First, it's important that the children can freely choose to do the work and practice it over and over (if they choose to). That can be difficult if you don't have a spot on a low shelf dedicated to that work or if you tend to use cloths for other jobs around the house. Also the way you present the work the first time is really important. In my Montessori album from training at Belmont I have a handout written years ago by the Princeton Montessori School. Among other things it says, "The young human is extremely receptive and tenacious regarding rules of behavior as first learned in any new situation." 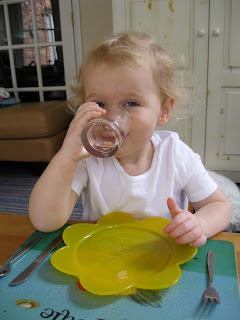 And, "The child is remarkably stubborn in her view that 'the first rules are the real rules.'" We can see this so clearly in toddlers! In applying that to home life we need to ask ourselves if we are clear enough in our presentations, asking, " What can he polish? Where should he do it? Which cloths does he use? Where does he put the cloths when he's done?" That sort of thing. If the child is encouraged to do a work but cannot do it independently, that's not ideal. And if he gets in trouble because he uses the kitchen towel, maybe we didn't make it clear which cloths he could use. Here's another quote from my Montessori album; "If the child can control how much time he has to work and choose what he will learn, he will become an independent learner." Also: "If we provide the tools he can express who he is. ... Your job [in setting up and maintaining a prepared environment] is to give him the keys to the universe." This helps remind us that it is the environment itself that is teaching the child. 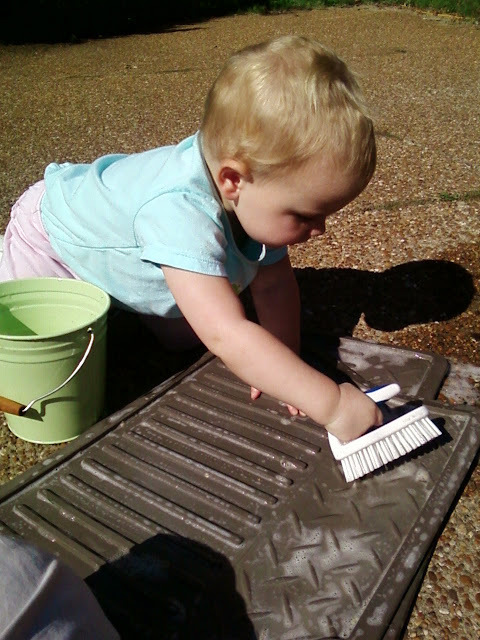 There are 11 basic human tendencies that are strong drives in children and polishing is a good example of three of them: the tendency to work, especially with the hands; the tendency toward repetition; and the tendency to correct our own errors. It's critical to be able to practice. So putting the work in a prominent place (at least at first) and making it easily accessible is important. If there is no basket out or item to be polished out in plain view the child may not have the impetus to polish. This explanation mostly speaks to your example of polishing. The idea of tools being miniature is purely for the sake of the child's independence. Children truly want to do REAL work and to do things for themselves. The tiny tools are simply the right size for their tiny hands! Thanks for explaining in more detail. That gives me the push I need to get started. It's just so overwhelming when we have all the other regular household tasks to complete! You know, it's funny - I attended a lecture given by Angeline when her book first came out, and I had a copy for her to sign. When signing, I told her I was a public Kindergarten teacher using Montessori in my classroom. Her reaction was obvious disgust and the words, "I can't see how you could POSSIBLY do that." This was before I had children, but I was shaken and angered at her reaction. After all, using Montessori in public school is ENTIRELY POSSIBLE, and I viewed my work as VALUABLE to my students. I am sad to hear that her point of view has not changed in the past several years. I admit that her work is popular, but I will never recommend it. To me, that attitude is the OPPOSITE of Montessori's, who worked for peace, justice, and equality for ALL. Homeschooling using Montessori philosophy is absolutely doable! Thank you so much for sharing your tips! I've been a Montessori teacher for 17 years, and I want to add another site for those of you who might want to purchase "the real thing" and not spend a ton of cash. Montessori Outlet has real Montessori materials at a fraction of the price that Nienhuis (the fancy schmancy "real" source) charges, and they are made to the same specifications. Not everything feels QUITE as solid as the Nienhuis version, but it's a fantastic source, and I highly recommend it. My school has bought several things from there, and we are a very traditional school that only wants the real thing. Also, I want to add that as a Montessori teacher, teacher trainer, and mom (who also tried to start a Montessori charter school once upon a time), I know that it is almost impossible to run an absolutely traditional Montessori classroom in a public school, mainly because of the challenges of not always having mixed age groupings, and also being required to meet specific curriculum goals. HOWEVER, that doesn't mean it's not worth doing. There are many wonderful elements of Montessori that can be brought to the current public school system, and to homeschooling (where I think it is easier, but does not provide as much opportunity for a larger social scene). If you have the core philosophy of Montessori at heart (follow the child), you can do so much, even with NO fancy materials. Maria Montessori's first school in Rome was filled with all handmade stuff, and she did what she did by observing the children and not assuming they would take to one thing or another. We can all follow in her footsteps, no matter our location, type of school, or amount of money of available. Thank you all, especially for Lola's comments. I am a former elementary ed teacher and school counselor. Now a stay-at-home mother of four, I want the best for my children. I just began collecting materials and while I believe in Maria Montessori's philosophy, I know I will not be able to do everything. (Though after reading many articles and blogs, one can develop some real "mom guilt" when feeling it's not enough.) I came upon this site when researching what people have found most worthy of purchasing vs making for their Montessori materials. Thank you for reminding me of the true spirit of Ms Montessori. Thanks. I am not sure why I didn't see this comment before, but please let me know what future topics would be helpful to you! wow! excellent review. Informative and interesting which we share with you so i think so it is very useful and knowledgeable. I would like to thank you for the efforts. I am tiring the same best work from me in the future as well. where did you get the veggie cutter that you have pictured???? Thanks for sharing your experiences. I found some interesting toys here. I'll buy it for my son. Too lovely! I also want to create these objects for my children. They surely will enjoy. Thank your post so much! If only i read your post early. If so, I have to know about how to set up your space without going broke. But, too late. Is there a "part 2"? This article explores the Montessori Method of education as a form of problem-posing education. It argues that our current educational system in the United States pushes students towards disliking learning and is closer to a system of manipulation and power than a system of education. Wow, this is a great idea! My son is 2.5 and I am thinking of placing him in a Montessori next year. So I am trying to prepare him at home to see whether it is something that he will like. Hi, I’m new to your page and I really enjoyed this post. Any suggestions on scope and sequence of 3-6 work? I’d like to read more on which works come before others, etc. thanks! Hi.. These tips were really helpful for me when my kids reached the age of montessori. These are amazing tips related to montessori.